A new state-of-the-art engineering centre has launched in Evesham to tackle a shortage of engineering skills in the area. 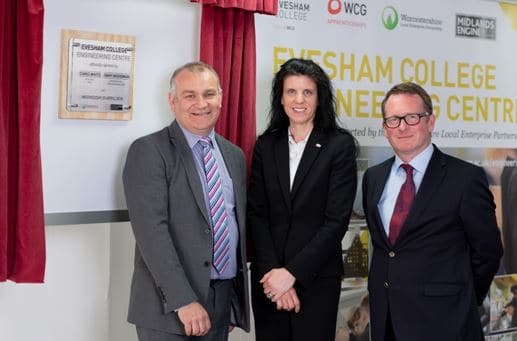 The specialist faculty at Evesham College is a joint venture by the college and the Worcestershire Local Enterprise Partnership, and will provide a real life engineering environment for trainees. The project represents a joint investment of over £430,000. The collaboration is in response to the skills needs in south Worcestershire and will enable the college to build further links with employers and schools to promote careers in engineering, as well as training for both full-time students and apprentices. It is hoped that the initiative will send the message to young people and those involved in giving careers advice that modern engineering is a high tech, exciting and rewarding career choice. The centre was officially launched on Wednesday 25 April by Chris White, President of WCG and Gary Woodman, Chief Executive of the Worcestershire Local Enterprise Partnership.